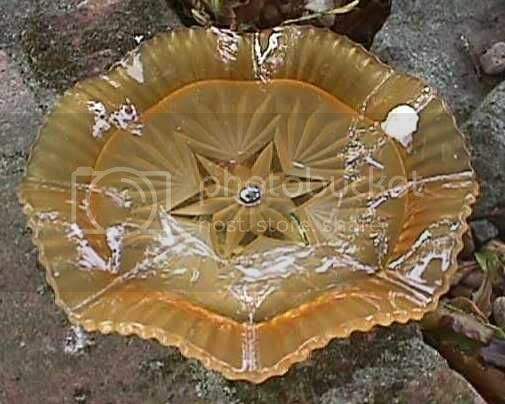 Here is a link to a photo of a glass plate with a chrome stand, this pattern on plates in amber and green also pink with a polished top and satin underside or satin all over. This glass is quite easy to find here in NZ, who was the maker has bug me for quite some time, on the photo is a white spot this is a silver label ( was hard to photo ) Sowerby Tyneside Glasswear. This may be common knowledge, but I wished to share it with all of you. Sowerby's 2455 (1/2) I think. Thanks for the photo Tony. I believe they are known on short metal stands and in two tier cake stands, as well as simply the glass "ruffled plate" by itself. Maybe Adam will be able to add some more info. Thanks for confirming this pattern as Sowerby. I have a double layer cake stand in green satin that I've been trying to name and you've confirmed it for me. ADDED NOTE: After another look at mine I see that the top is smooth and shiny like Tony's and the underside only is satinised. I'm getting a bit rusty on some of the pattern numbers but I'm sure you are right, Glen. We called it "crimped", not "ruffled"! I'm not sure of the age of Tony's example but yours, Anne, is right in the middle of "my" period. The T centre handle and extension were by Wm Lindop of the Birmingham area. I have fond memories of him as he kindly re-plated the hub caps of my Standard Vanguard! At that time the underside was certainly "sand" (i.e. less toxic abrasive) blasted before the star was polished off. Pre-WW2 they might have been acid etched, but I'm not sure about that. Acid work wasn't re-started after the war, at least when I was there. I just love hearing from Adam. I think we should declare him a National Treasure. :lol: Adam thanks so much for adding that wonderful personal information - a magnificent touch. Glen, I agree 1000% about Adam. Adam, thank you for the extra info - it's lovely to be able to add details like you gave to my glassware. You say my cakestand is in the middle of your era - could you give me an approx date for that please? I must say that I do love this stand - it looks wonderful with a small cake selection on it. Here is another photo to show the chrome stand, which is 2.5" high and the plate is 8"
My plate is like Adam says sand blasted and the star polished off, I will keep a look out for others and see if I can find any that where acid etched. When was this pattern first made? ADAM.......I was intrigued by your mention of chrome plating and wondered if you had any knowledge of Davidsons initial association and then take over by Abrahams of Birmingham. I have one of the 'BRAMA' catalogues showing Davidson glass on various chrome stands but I often wondered if they did chrome plate for other companies or used other companies glass. There were a number of companies doing plated ware who bought in glass and pottery from manufacturers and then sold on the combined article. Abrahams used glass from other manufacturers beside Davidson. Bagley for example. 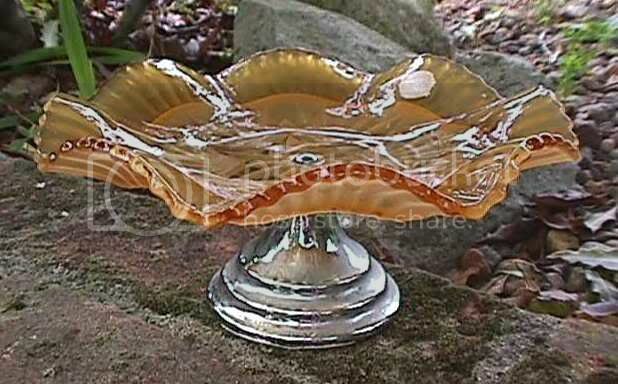 You also find the same plated or chrome handles on cake stands made of both glass and pottery. For example the same handle appears on the plate discussed in this listing and on plates by Davidson. Question (probably a daft one, but I don't know the answer so I'll ask it anyhow! ): How is it possible to tell if the bottoms are sand blasted or etched? The raised part of the star underneath mine is polished and Adam says it's almost certainly sand - how different would it be if it was etched, and would the star then not be polished? Looking at my Bagley cake stands their metal parts are a totally different style to the Sowerby one, although Tony's Sowerby one is a similar shape to the one on my as yet unknown stand/comport/fruitbowl (the teal coloured one) but the latter has a dull finish like flat aluminium rather than polished chrome. I wonder who made the metal parts for those? Are there any catalogues for the metalware still extant?